For information on time, places, and event...see the 2018 Show Page here. Newest entries at the top...this blog runs the whole show. The Sluice is up and running at the show! You can buy a bag of material and placer (using water) mine out the wonderful gem and mineral specimen inside! This lucky young man found tigereye, amazonite, rose quartz and bloodstone among other things. Doors are open. 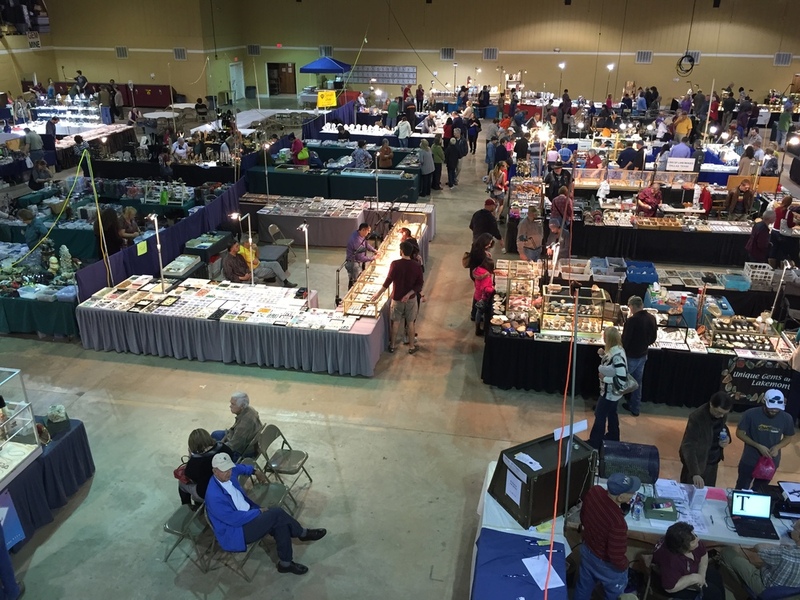 The 24th Annual Rock & Gem Show is open! For information on time, places, and event...see the 2017 Show Page here. Lots of great mineral specimens available are from the vendors at the Annual Show. From micro-mounts to huge display pieces, bargain priced all the way up to investment-priced. There is something for every collector. Great things to find in the Gem Sleuce! Just look at what one lucky young man found...that's a fist-sized quartz crystal! 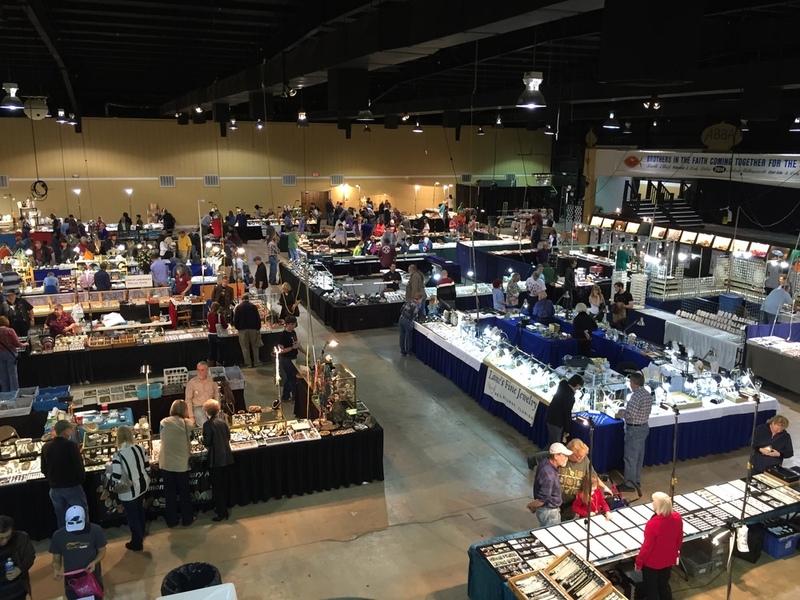 The doors open for the last day of the Annual Rock, Gem & Jewelry Show at 10:00 AM! We hope to see you there! Day 2 of the show is now over. We hope to see you tomorrow for the last day! In addition to the many vendors and demonstrators at the show, there are also lots of activities for adults and kids (of all ages). There is a working gem sleuce where you can get a bag of material and mine for your own gem stones. In the sand pit kids (of any age) can dig for gems and keep what you find. You can also make a gem tree and paint rocks. If you make beaded jewelry, there are many vendors at the show with a wide variety of supplies for your projects. 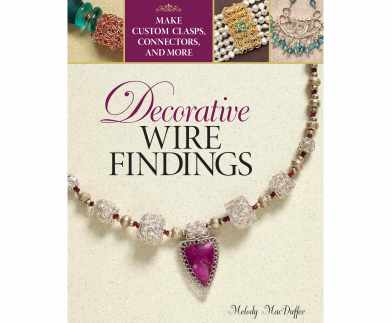 While you're looking for that perfect bead, come by and see wire-wrap artist and published author Melody MacDuffee. Flint Knapping demonstration coming up at 2:00 PM. Come watch Guy making a flint knapped arrowhead and learn about ancient technologies. Doors are open for day 2 of the show! Do you like fossils? Vendors at the Annual Show have all manner of fossils for you...ammonites, trilobytes, sharks teeths, peterified wood. Take a look at a small sample of what is available. Doors are open! Come by and check out the silent auction and the raffle prizes (only $1). 1:00 PM - Show Opens! The Gem Sleuce will be open all day. There are hourly door prizes and a running silent auction all day as well. Final preparations. 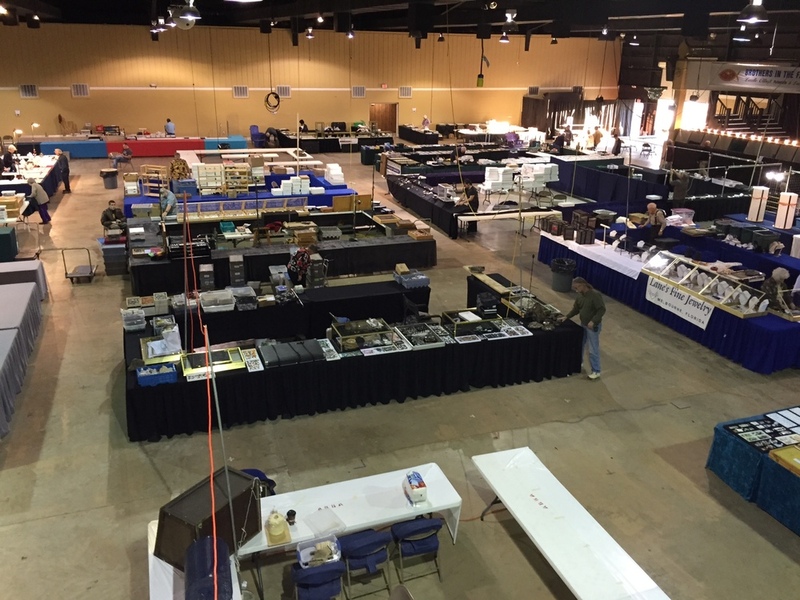 Dealers and Mobile Rock & Gem Society members alike are busy this morning putting all the finishing touches in place for the show to open at 1:00 PM. There are several new vendors this years as well as many returning favorites. We hope to see you at 1:00! We're wrapping up 2 days of set up for the show. 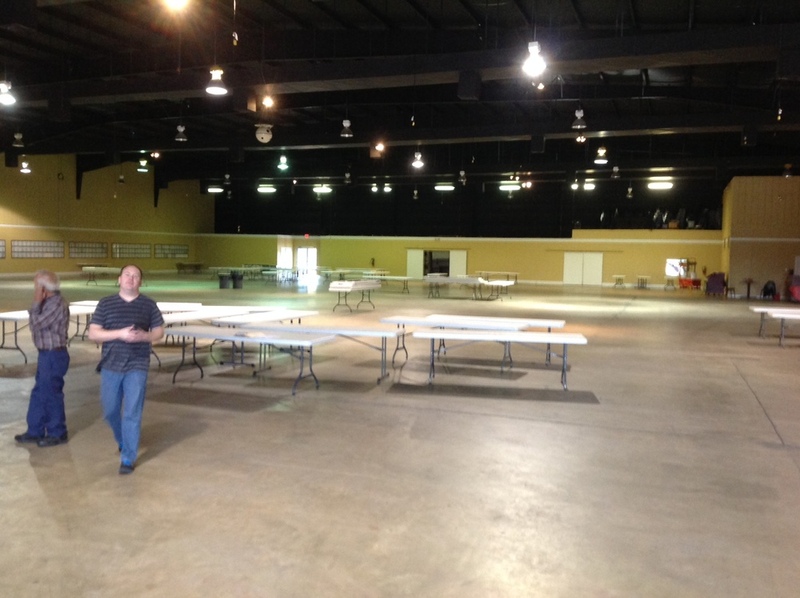 200+ tables in place, hundreds of feet of electrical, chairs, signs, display cases...and lots of tired Mobile Rock & Gem Society volunteers. We're done for now. Dealers start arriving Thursday afternoon. In the meantime, we are going to go enjoy Thanksgiving. We hope you and your family have a happy Thanksgiving as well. We'll see you Friday afternoon at 1:00 PM for the show opening! We're happy to announce that Melody MacDuffee, author of multiple books on wire wrapping and jewelry making will be a feature artist and demonstrator at the 2017 Show. For information on time, places, and event...see the 2016 Show Page here. The 2016 Annual Show has come to an end. On behalf of the members of the Mobile Rock & Gem Society and of all the dealer at the show, thank you for coming out this year. 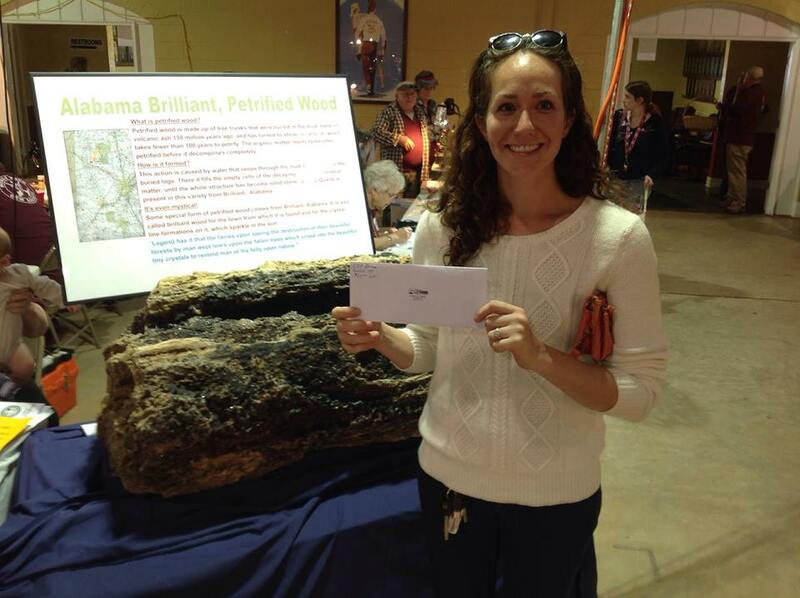 We hope you found many treasures, and we look forward to see you again next year. Labradorite is a feldspar mineral most often found in igneous rocks. Some specimens exhibit a strong play of iridescent blue, green, red, orange, and yellow colors. Labradorite is so well known for these spectacular displays of color that the phenomenon is known as "labradorescence." Specimens with the highest quality labradorescence are often selected for use as gemstones. You can learn more about labradorite here and here. There are many great examples of labradorite available at the show this year, from rough, to cabochons, to beautiful display pieces. The mineral pyrite, or iron pyrite, also known as fool's gold, is an iron sulfide with the chemical formula FeS2. This mineral's metallic luster and pale brass-yellow hue give it a superficial resemblance to gold, hence the well-known nickname of fool's gold. Pyrite deposits in many different forms. Most commonly occurring in a cube shape, it can also form in association with other minerals (quartz, inclusions in lapis lazuli, etc...). Pyrite can also be the mineral replacement in fossilization. There are many excellent examples of pyrite at the show this week, from beautiful clusters of cubes, to pyritized (fossilized with pyrite) ammonites, and sand dollars. You can learn more about Pyrite here and here. Day two of the Annual Show has come to a close. 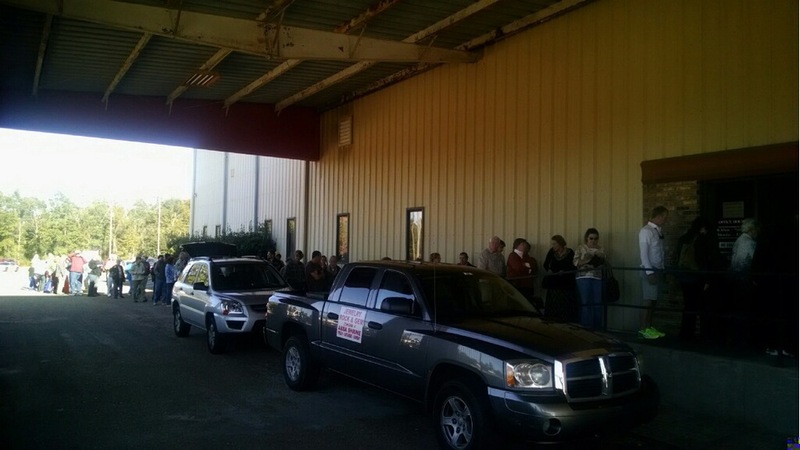 Thank you to the more than 600 people who came out and visited our great dealers today. We hope you found treasure! See you again at 10:00 Sunday for day three. Do you like opals? Opals of all kinds are available from the dealers at the Rock & Gem show. Rough or polished and mounted in jewelry. From Boulder opal to Weblo, its all here. If minerals are of interest to you, the Rock & Gem show has you covered. Dealers at the show have minerals covering every interest and price range. From micro, postage stamp sized samples all the way up to huge display pieces, and priced from $1 up to several thousand. Our first gem tree making class of the day is finishing up. More treasures created! The next class starts at 3:00 PM. Flint napper Guy Meador will be doing a demonstration of ancient flint knapping techniques at 2:00 PM. Guy not only demonstrates ancient stone tool making, he also sells supplies so you can learn to do this yourself. You can learn more about knapping here, here, or here. There is a real, working gem sleuce at the show this year. You can buy a bag of material ($10) and use the sleuce like a real placer miner to find the gems hidden in the sand! Doors open for day 2 in about 5 minutes! Day one has come to a close. Thank you to the 464 people who came out to the show today. We hope you found something amazing! See you again in the morning at 9:00 AM for day 2. Malachite is an copper carbonate hydroxide opaque, green banded mineral that most often forms botryoidal, fibrous, or stalagmitic masses. There are many great example available at the show from $5.00 polished samples all the way up to expensive museum-quality display pieces. If you would like to learn more about malachite, check here or here. Do you like Ammonite fossils? Ammonites are ancient sea creatures very similar to the modern nautilus. Their fossilized shells are amazing. You can learn more about Ammonites here. Rarely the shells will fossilize into a beautiful iridescent gemstone material call Ammolite (info here). Doors are open! Our A-team of greeters is waiting to welcome you to the show. 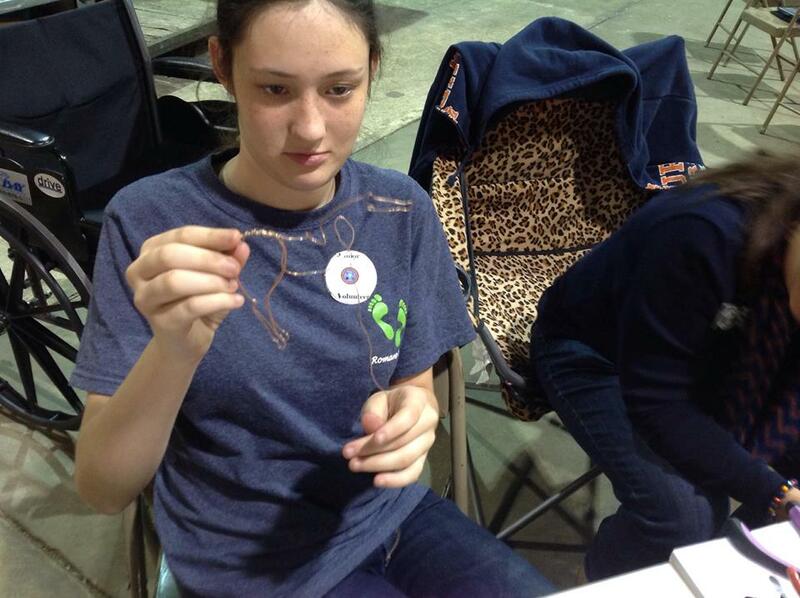 We have demonstrators at the club booth showing how to facet gems, wire wrap jewelry, and how to embosse copper. The doors open at 1:00 PM. Dealers are putting last minute touches on their booths, and there is a bee hive of activity all over the show floor. 1:00 PM - Doors open! 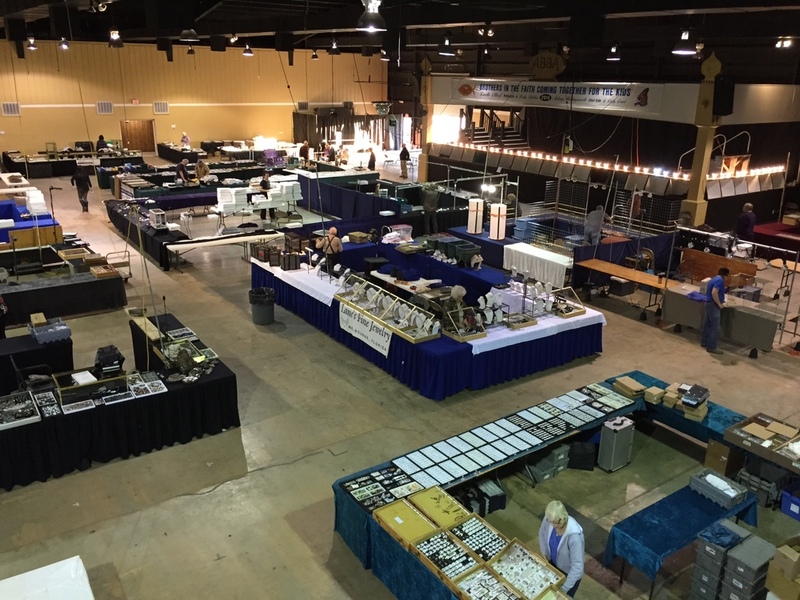 Wow...two days of set-up for the Annual Rock & Gem Show are done. Almost 300 tables arranged for over 30 vendors and displays. More than half a mile of electrical run. Club booth, Junior's area, a demonstration area, and a gem sleuce in place. 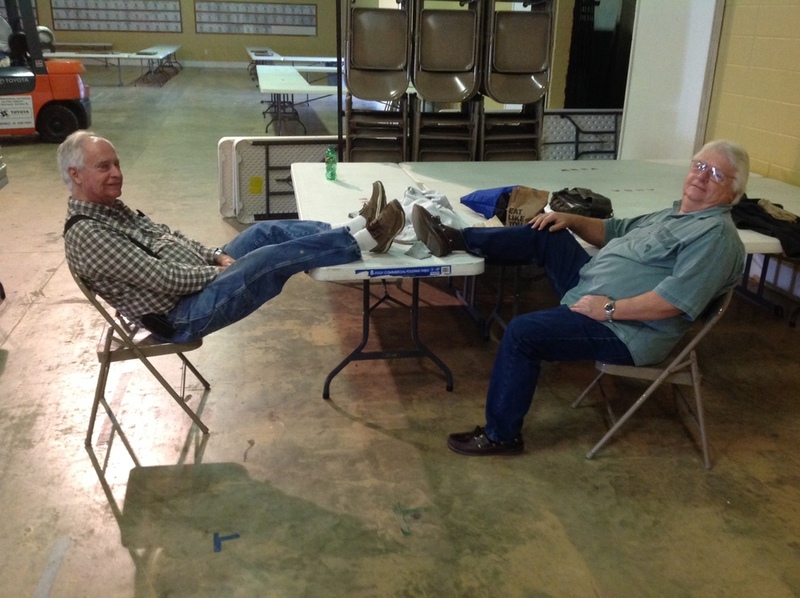 Now the tired volunteers of Mobile Rock & Gem go home to rest and prepare to celebrate Thanksgiving. We wish all of you a happy and safe Thanksgiving. We'll see you Friday at the show opening! ...and at some point that 900 lb chunk of brilliant petrified wood has to be loaded up, hauled in, and set in place. Only 5 short days left until the show opens it's doors! Members of MRGS will be busy all this week setting up everything it takes to put on a show of this size. 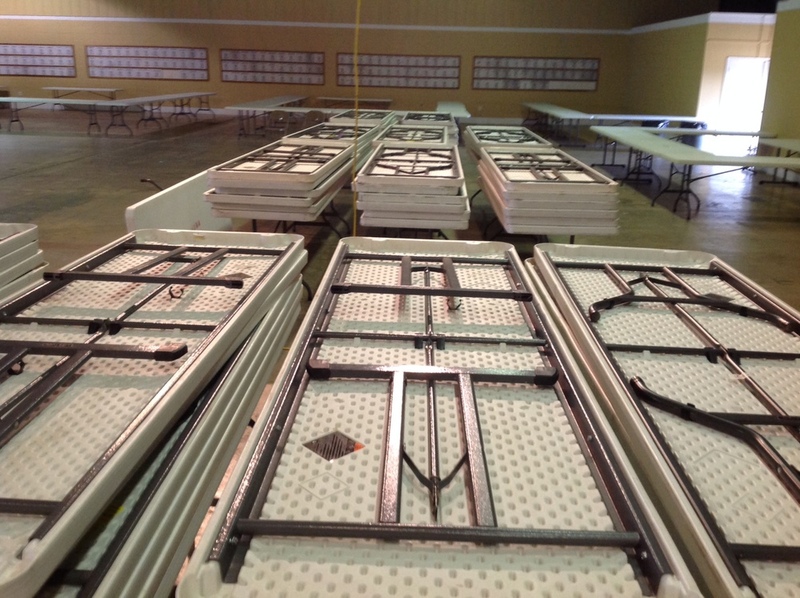 The dealers start arriving Thursday (Thanksgiving) afternoon to set up their booths. Then the doors open on Friday afternoon. Just like last year, we'll have pictures of the set up coming as the week goes by, and this blog (and the Facebook page for the show) will stay active during the show. It is 5 weeks until show set up starts (the Monday before Thanksgiving), and 6 weeks until show time (Friday, November 25th)! You can follow us at the Mobile Rock & Gem Society Facebook page. You can keep up with the latest Annual Show happenings at the Mobile Rock & Gem Society Annual Show Facebook page. 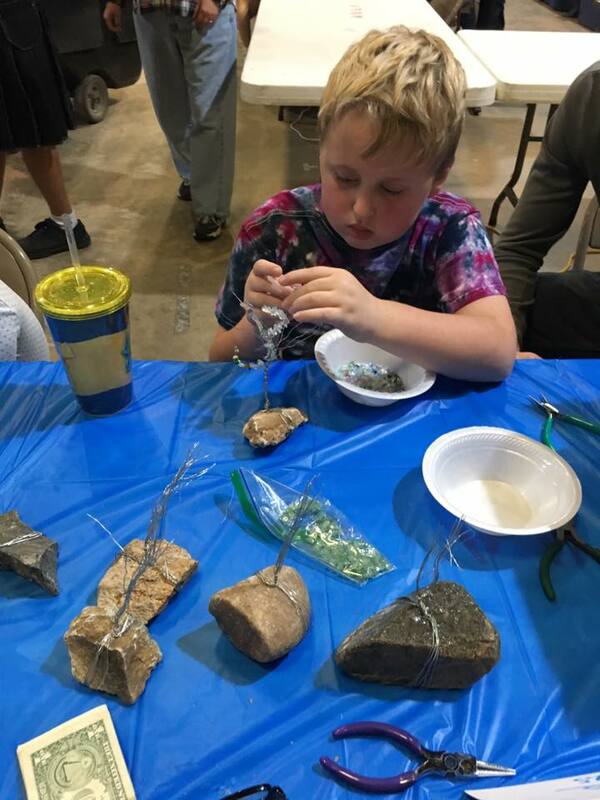 You can see what our Junior Rockhounds are up to on their own Mobile Rock & Gem Society Juniors Facebook page. You can get those discount coupons printed out and ready for show time (or just show them on your mobile device at the gate). You could check out our website...Hey! You're already here! While you're here, check out our Calendar of Events, or view the photo galleries from previous Annual Shows (bottom of the page). ...or you could watch an otter play with rocks! For information on time, places, and event...see the 2015 Show Page here. 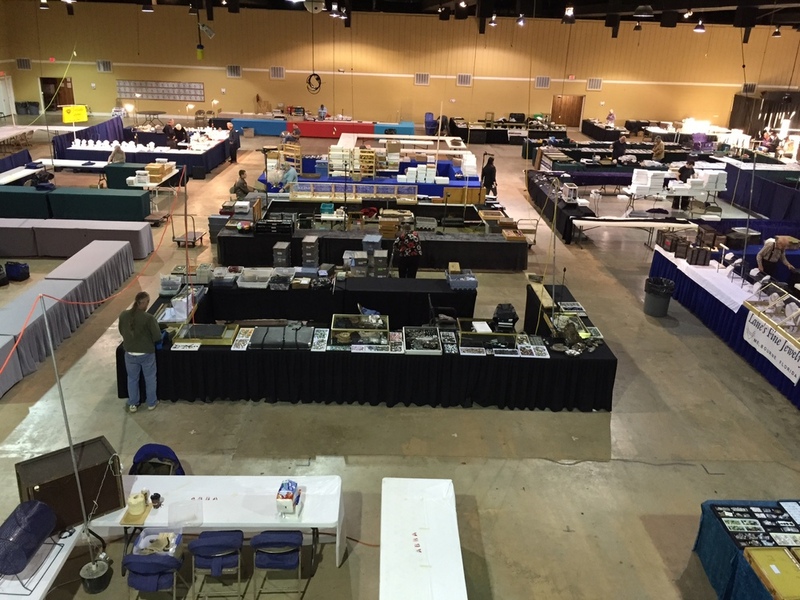 The 2015 Rock & Gem Show is over. 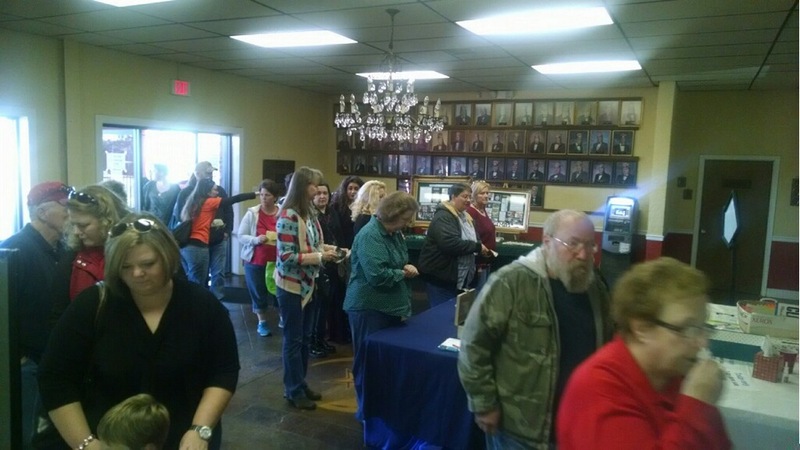 On behalf of the Mobile Rock & Gem Society and all the vendors, thank you for coming out to see us. We hope you had a wonderful time. See you next year! Pictures from the 1:00 PM Gem Tree making class. If you are a fossil collector, you need to check out the wide variety of fossils at the Rock & Gem Show...including shark teeth. Ancient to modern...mundane to Megalodon. 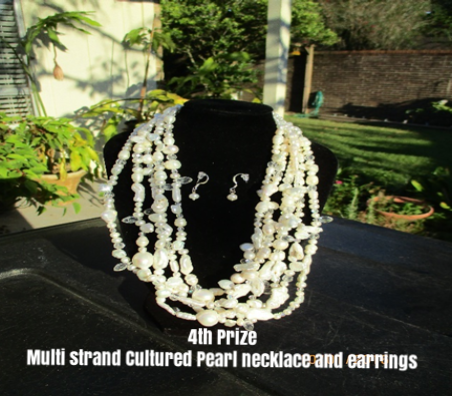 Looking for jewelry? For yourself or that special someone? One of the many jewelry vendors at the Rock & Gem Show has what you are looking for. New or vintage, inexpensive or heirloom their is something for you. There are even vendors with loose stones. Do you collect minerals? Are you interested in starting? Either way the vendors at the Rock & Gem Show have what you are looking for. They have everything from very inexpensive thumbnail specimens at the way up to huge (you're going to need help getting it home) display pieces. Lapis Lazuli is a deep blue material that makes both beautiful jewelry and eye catching display pieces. There is a wide selection of Lapis available from multiple vendors at the Show. Do you like Ammonites? If your answer is yes, then several of the vendors at the Rock & Gem show have just what you are looking for. Enjoy the pictures. If you are a fossil collector, or really just interested in unique things, you need to check this out. Vendor Lane's Fine Jewelry has one of the most unique items you'll ever find...fossilized dinosaur eggs! Day 3 is underway! Show closes at 5:00 PM today. The Doors open for day 3 (last day!) of the Annual Rock & Gem Show at 10:00 AM. We hope to see you at the show! 5:00 PM - Doors close! The show will be closing in about 15 minutes. Thank you to the 658 people who came out to see us today. We hope you found something special, and that you'll come back and see us again tomorrow. Doors open in the morning at 10:00 AM. 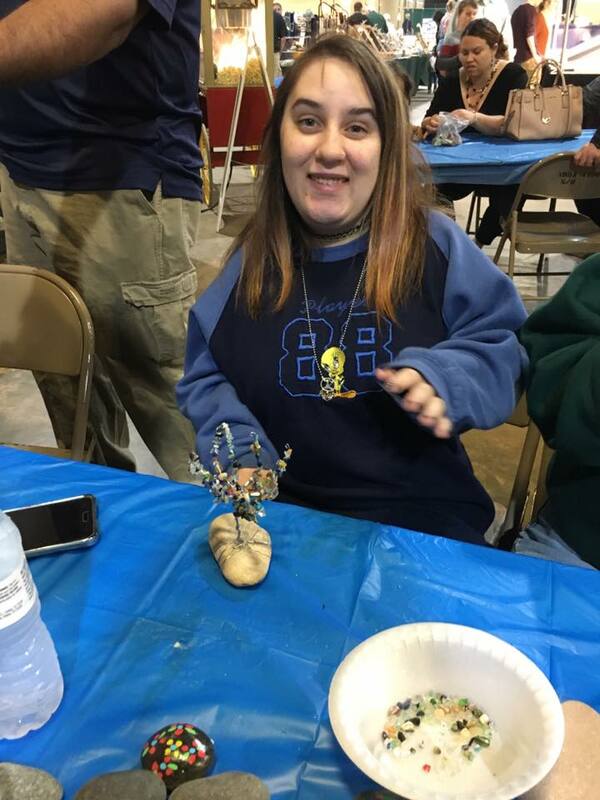 Pictures from the 3:00 Gem Tree making class. The next class will be Sunday at 1:00 PM. Pictures from Guy's Arrowheads and Stuff flint knapping demonstration. There will be another demonstration Sunday at 2:00 PM as well. One of the door prizes at today show was a softball-sized geode donated by Kieth Harmon of Stone Crystals. Lucky show-goer Dan won the drawing and Mr. Harmon cracked open the geode for him. The first people ever to see the inside of this treasure. Dan has very graciously agreed to leave the geode on display at the club booth until he leaves the show today. Thanks Dan, its a real beauty! Our first Gem Tree making class of the day is finishing up. 14 people make a unique treasure to take home. The next class is at 3:00 PM today. Enjoy the pictures. Doors are open for day 2! Day one of the Rock & Gem Show comes to a close. Thank you to the 478 people who came out to see us today. We hope you found something special. Come back and see us Saturday when the doors open at 9:00 AM. Our first gem-tree making class is going full blast! Lots of activities for kids in the Juniors area. There are coloring sheets and rubbings. There are also fossils to paint ($1/each), a Gem mine to dig in for your own gemstones ($2) and fossil bags you can shift out yourself ($3). 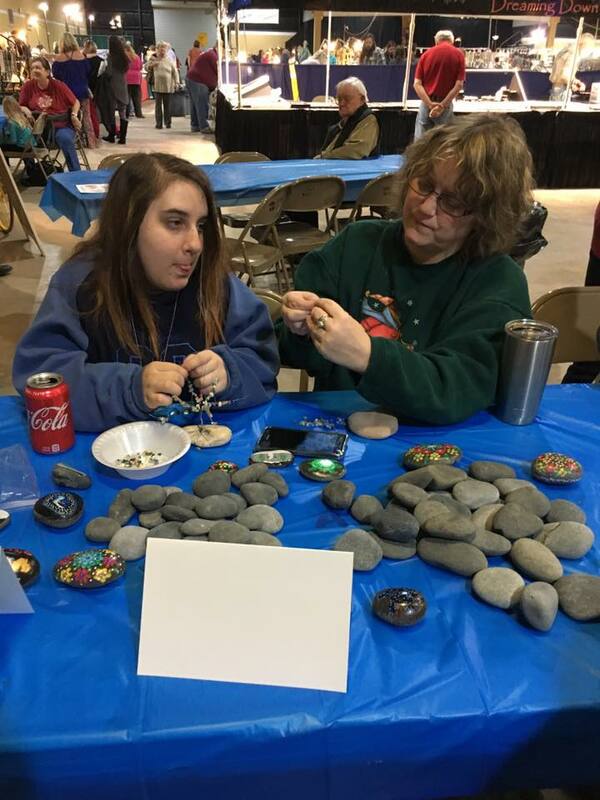 At 3:00 PM and 5:00 PM today (and at other times throughout the weekend..see the Annual Show page for event details) there will be gem tree making classes ($5 fee). The Old Prospector and his trusty rouckhound Barney have also stopped by for a while. Magpie Gemstones is a small family owned business in the Okanogan Valley in Washington State, we have been buying and selling gemstone beads for many years and making jewelry for a living for even longer, over 2 decades now. We know our stones and are constantly learning more. We disclose all known or suspected treatments and take pride in our honesty and integrity in the gem trade. You can follow Texas Magpie at their website, or on Facebook. Doors opening in 30 minutes. Pretty much everything is set. Our A-Team of greeters, Karen, Prim, Dee, and Andy are ready to welcome you...come out and enjoy the show! See the Fox-10 TV spot that ran today with two of our own telling everyone about the show...here. Hundreds more feet of electrical run...a forest of poles and wires as we get power from the ceiling and edges of the event floor to all the little islands that are vendor booths. Most of the club spaces are ready for visitors. We'll take a short break for Thanksgiving, then Thursday afternoon we take busy up a notch as the vendors start arriving and we make the final push to Friday's 1:00 PM opening. Final preparations for the show are being made. 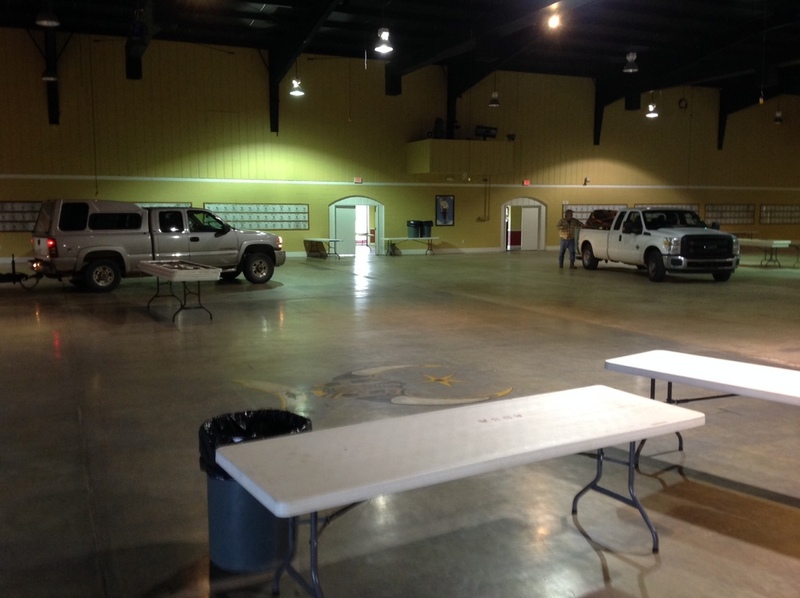 Members of the Mobile Rock & Gem Soceity will begin setting up for the show on the Monday before Thanksgiving. Vendors will begin arriving Thanksgiving afternoon and setting up. The doors open at 1:00 PM the Friday after Thanksgiving. 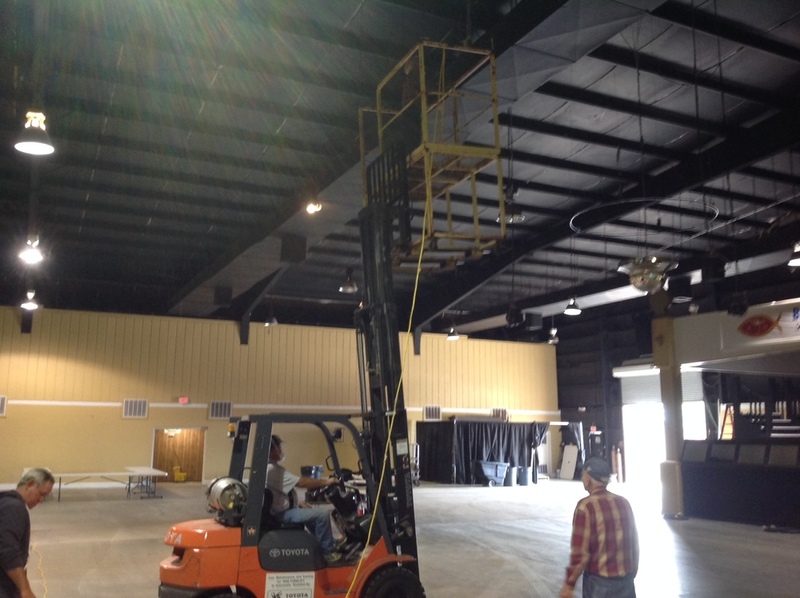 Pictures from setting up the 2014 Show (November 25-28). 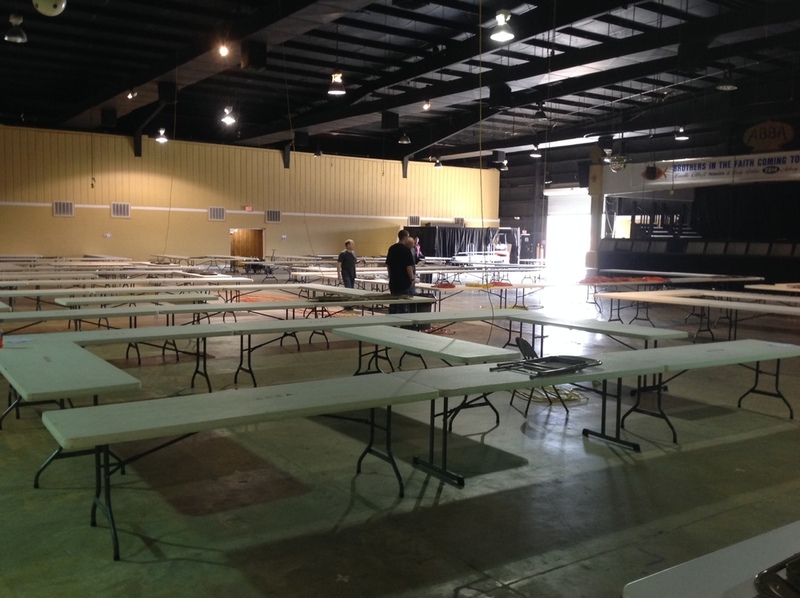 Over four days (Tuesday and Wednesday, Thanksgiving afternoon, and the morning before the show opens) a handful of Mobile Rock & Gem volunteers set up about 200 tables, and strung nearly half a mile of electrical cable to get the Abba Shrine ready for our vendors. The vendors start setting up Thanksgiving afternoon and and most are still putting the finishing touches on their booths right as the doors open. 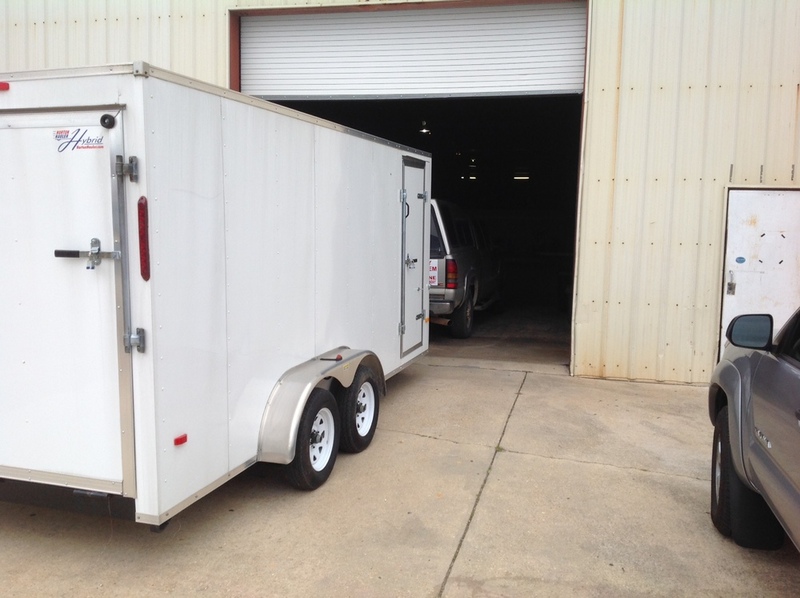 Mobile Rock & Gem Society supports the University of South Alabama Geology program, Bishop State Community College school of Jewelry Design, and University of Mobile Geology Studies through scholarships and donations. Each program has an informational display at the show. The USA Geology program also displays posters created by geology students as part of their advanced geology studies. In addition to the schools. Our vendors and club members also set up display cases to show case their work and collections. 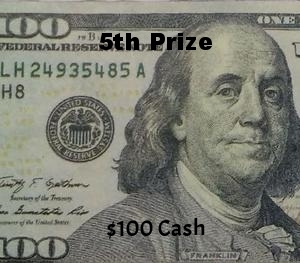 When you come to the show, don't forget to visit the information booth to buy a raffle ticket (you can see close ups of the prizes on the 2014 Show Page). 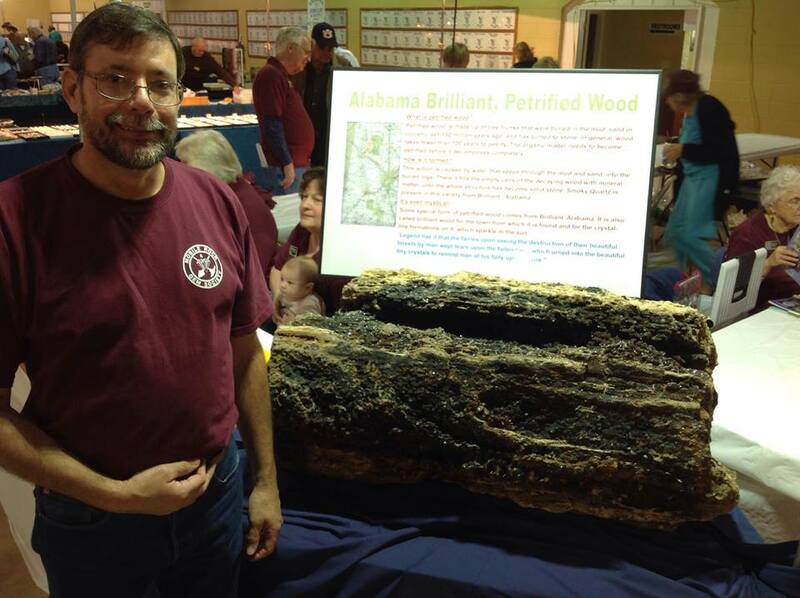 Also remember to check out the giant log of Brilliant Wood from right here in Alabama. Brilliant wood is petrified wood filled with tiny crystals (druze). The picture doesn't really do it justice. Come by and dig for gems and fossils at the sand pit, or paint a fossil of your own to take home. The doors open...time for the show to begin. Friday, 3:39 PM - Lots of people, and the sand pit is "rock'n"
Friday, 6:52 PM - Day 1 of the Rock & Gem Show comes to a close at 7:00 PM. 510 people visited the show today. Thank you for coming out, we hope you had a good time. See you at 9:00 AM Saturday for day 2! Saturday, 9:00 AM - Doors opening for day 2 of the Rock & gem Show. Vendor Profile - Natural Selection Crstals, NSC (Web / Facebook), is new to our show this year. Jordan, the proprietor, is finishing a Doctorate degree in Physics and Geology and has turned his love of geology into a business. 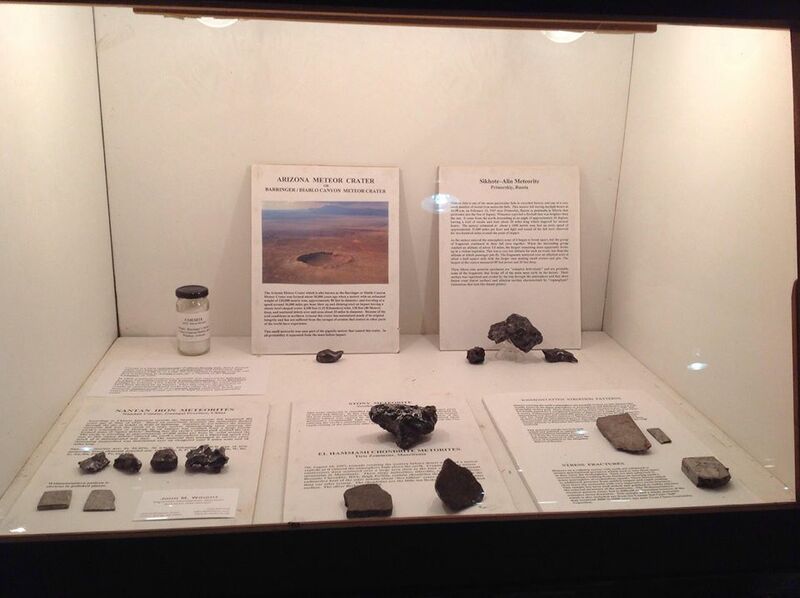 NSC has an extensive collection of minerals from around the world, and Jordan is a tremendous resource for information on their origins and formation. Saturday, 12:00 PM - Geode Cracking Demonstration. Thanks to Keith Harmon of Stone Crystals (a regular vendor at our Annual Show) for showing everyone how its done. Vendor Profile - Wild Sage Native American Jewelry (Web), is new to the show this year. Wild Sage is base here in Alabama and carries Zuni, Navajo, and Hopi handmade jewelry. Each piece is labeled with the tribe and name of the individual craftsman. The workmanship in these pieces is breathtaking...handcrafted in silver with lapis, turquoise, opal and other precious and semi-precious stones. Pictures cannot begin to do them justice. 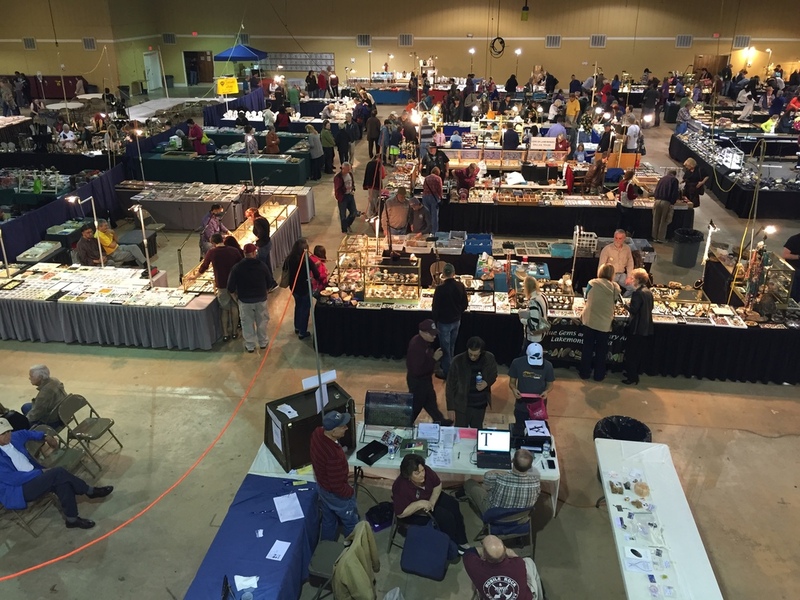 Saturday, 6:00 PM - The doors are closed on Day 2 of the Rock & Gem Show. Thank you to the 601 people who came through today. We hope you found something wonderful! See you Sunday morning at 10:00 AM. Sunday, 10:00 AM - The doors are open! Come out and find something that rocks! Vendor Profile - Guy's Arrowheads & Stuff. Guy is an accomplished flintnapper (or, as he says, ten years of experience and still learning). Guy has flintnapping supplies and handmade napped arrowheads and knifes. He also demonstrates ancient flintnapping techniques. 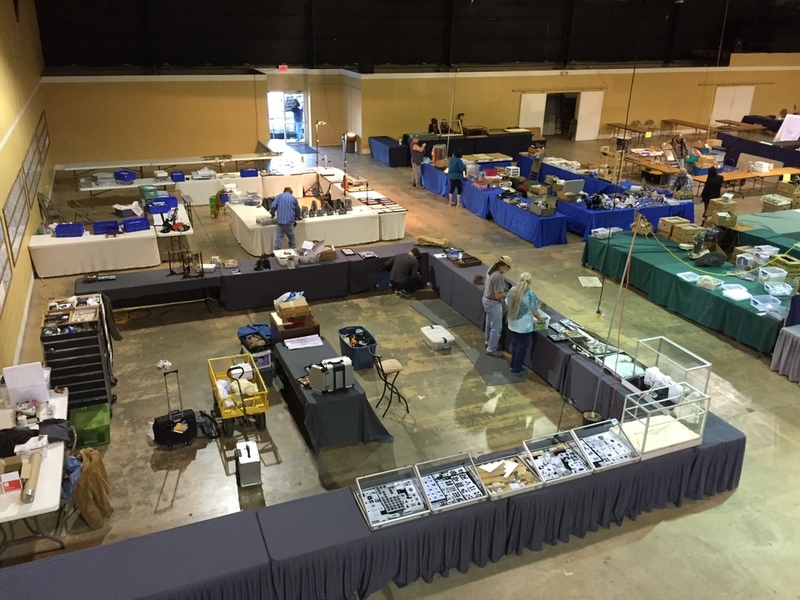 Sunday, 5:00 PM - The 2014 Annual Rock & Gem Show has come to a close. On behalf of all the vendors and the members of the Mobile Rock & Gem Society, we hope you had a wonderful time at the show and that you found something to treasure. We'll see you next year! Display Case Contest - Mobile Rock & Gem member Chesley Sanders won our display case contest for his display of a collection of micro-mineral samples.